Tom O'Gorman's palette will be part of the exhibit “La Palette: The Chicago Palette,” which opens Sept. 19 and runs through Nov. 29. JEFFERSON PARK — A new exhibit at the Ed Paschke Art Center will examine how several Chicago artists create their work and explore the relationship between the process of creating it and the finished piece of art. ”La Palette: The Chicago Palette,” which will open Sept. 19, will feature Dr. Stephen Sheldon’s in-depth examination of the artist’s palette as a microcosm of their finished work. A palette is a thin board or slab on which an artist lays and mixes colors. As part of the exhibit, Sheldon — an expert on pediatric sleep disorders and a professional photographer — will place high-resolution photographs of the artist’s palettes alongside the original finished works of a number of Chicago-based contemporary painters. 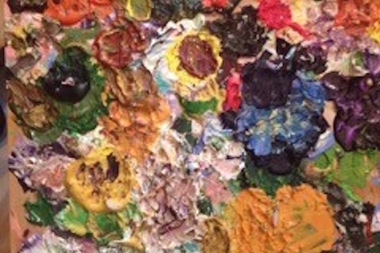 As revealed by Sheldon’s portraits, some palettes are highly organized by academic methods of color theory while others are arranged whimsically and depict the artist’s mood or focus. The exhibition taps into the growing field of technical art history that seeks to understand an artist through his or her process, exhibit curators said in a statement. The Ed Paschke Art Center, 5415 W. Higgins Ave., in Jefferson Park, is dedicated to showcasing the colorful and up-close paintings of people's faces that made Paschke one of the most famous artists to call Chicago home. Paschke often said “You can tell a true artist from their palette,” Sheldon recalled in a statement. The full lists of artists to be showcased in the exhibit are Paschke, Peter Axelsen, Roger Brown, William Conger, Michelle Grabner, Richard Hull, Wesley Kimler, David Klamen, Vera Klement, Amy Lowry, James Mesple, Anita Miller, Tom O’Gorman, Sandra Perlow, Clarrisse Perrette, Nancy Rosen and James Valerio. The exhibit is scheduled to close Nov. 29.